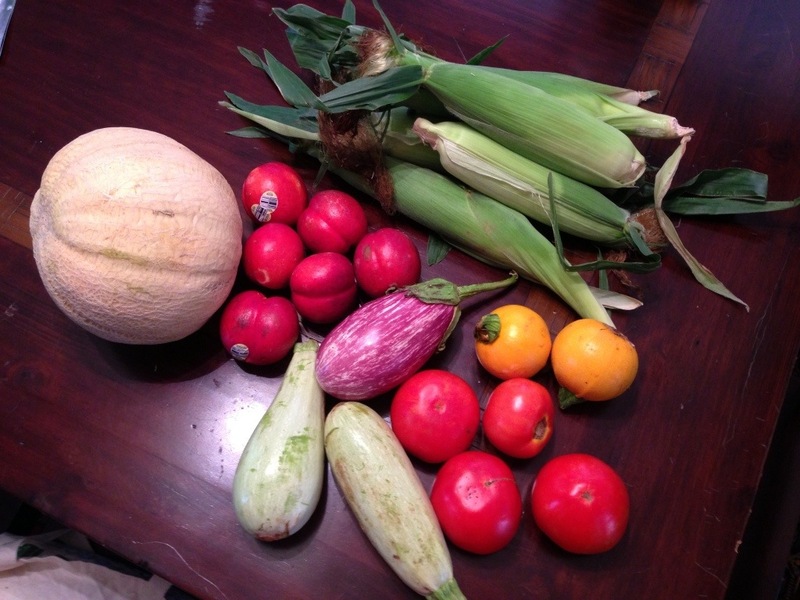 “Wow!” Was what I said when I got to the farmer’s market this week to pick up our CSA. Clearly the abundance of summer produce is in full force here. The cantaloupe is perfectly ripe and sweet. G and I had some after lunch today. The nectarines need to ripen but don’t have far to go. The tomatoes were listed as sauce or canning tomatoes. Does this mean they don’t have as much flavor or that they will be mushy? Thoughts? I’m planning on making a corn and sausage pasta with some of the corn and may roast the other ears. I’ve really gene enjoying my roasted squash and eggplant so will probably continue down that path. Yesterday, I made some quinoa and tossed in some roasted eggplant, zucchini, and yellow squash. Then, I added feta cheese, lemon juice and olive oil. It was light and refreshing.